USS John F. Kennedy (CV-67) (formerly CVA-67), Ship Characteristic Board SBC-127C, is a decommissioned supercarrier of the United States Navy. Nicknamed "Big John", she was named after the 35th President of the United States, John F. Kennedy. Kennedy was originally designated a CVA, or strictly an air combat ship; however, the designation was changed to CV to denote that the ship was capable of anti-submarine warfare, making her an all-purpose carrier. 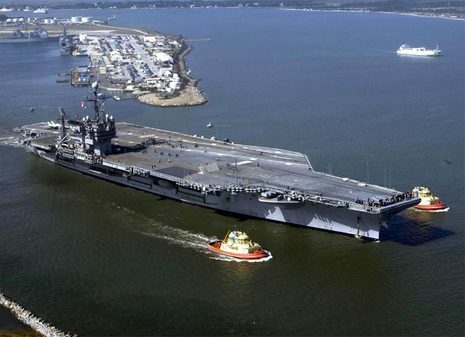 After nearly 40 years of service in the United States Navy, Kennedy was officially decommissioned on 1 August 2007. The ship is berthed at the NAVSEA Inactive Ships On-site Maintenance facility in Philadelphia, Pennsylvania, awaiting determination of her fate. The USS JOHN F. KENNEDY was the last conventionally-powered aircraft carrier built by the US Navy. Originally scheduled to become the fourth KITTY HAWK class carrier, the JFK received so many modifications during construction that she formed her own class. 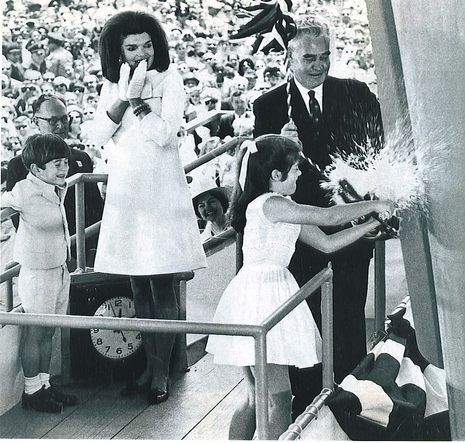 Named in honor of the 35th president of the United States, John F. Kennedy who was assassinated on November 22, 1963 in Dallas, TX., the USS JOHN F. KENNEDY was the first ship in the Navy to bear the name.